As returning Fringe World favourites, the Djuki Mala dancers need no introduction. The ensemble’s charismatic blend of choreography from both traditional and contemporary Yolngu culture has been a hit with audiences around the world. Despite their global success, the group remains down-to-earth and unassuming, as this Q&A with Djuki Mala dancer Yalyalwuy Gondarra reveals. Seesaw: When did you first know that you wanted to be a dancer? Yalyalwuy Gondarra : I didn’t always want to be a dancer; when I was younger I wanted to a professional chef. But Djuki Mala (when they were known as the Chooky Dancers) kept popping in and out of my life, with family dancing with them. Then they stuck in my mind. So the dancing found me and I am sticking with it. YG: When I first became a Chooky dancer I had two weeks to learn the whole show. I learnt it in Sydney with the older dancers and choreographers, and I just followed the older boys… keeping up with them was hard but two weeks later I felt good. I loved it straight away. First time I performed to a big audience was at Blues Festival with my cousin Baykali. I wasn’t even that nervous because growing up I was always dancing back at home in groups and performing to our family on the basketball court at disco. I loved looking out and seeing the big crowd – everyone clapping or dancing with us, just having fun. YG: My career highlight with Djuki Mala is hard to choose… I think for me it’s actually just always being with [the Djuki Mala team] and travelling the world with my best friends, family and now girlfriend. Egypt is my favourite place we have toured, the pyramids and history of the place was so amazing. I took so many photos with those pyramids! YG: The worst part about being an artist is getting homesick. Especially when sad things happen back at home, you just want to be with family not faking a smile on stage. But it’s my job and it’s what we do. It’s important to tell the story of my culture. 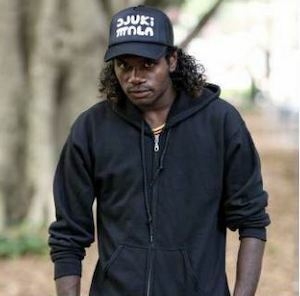 S: What made Djuki Mala decide to return to Fringe World? YG: We have performed at Fringe World Perth three times now; some of our best and biggest fans are here! Sometimes we even get stopped in the street for a photo… I get shy though. It’s important to be humble. S: And what do you, personally, enjoy about the Festival? YG: My favourite thing about performing in Fringe World is meeting other people and making new friends… some of my best friends I met on tour. I also love seeing other shows and what other stories there are being told. YG: Growing up, I just loved playing with sand. I am an Island boy, so I love anything to do with the beach. At playgrounds I would always look for the sandpit because it made me feel like I was at the beach. 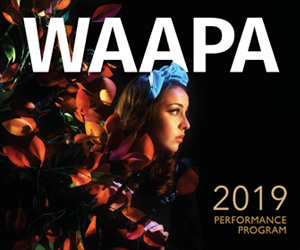 You can catch Djuki Mala 18-25 Jan, 9-17 Feb at The West Australian Spiegeltent, The Woodside Pleasure Garden. Read Jenny Scott’s review of Djuki Mala’s 2018 Fringe World Show.